This talk has taken place during PASS Summit in Seattle, WA, on 2nd November 2017 (Thursday). Do you want to know how Cathrine has started her adventure in IT? How difficult is to be a woman in IT and how we can help in struggling with prejudices? Who is one of her personal guru? Finally, how is a correct Norwegian pronunciation of her surname? Listen to this podcast to get to know how Cathrine became her journey to IT and how tough can be for women in the IT. KN: Thank you for accepting my invitation. KN: Yes, that’s very hard. CW: I am a very active volunteer in the PASS Community, I have been working as the PASS Community Evangelist for the last year and I am coming on my last month there and then I will go back to just being a volunteer. After that I will be working on Data Warehousing and BI projects and very focused on Biml. That’s my big thing. KN: Yes, true. Recently your new book has been released. CW: It has, yes.It actually hasn’t been released yet. You can preorder it. It is done but I think it will be released early December. So that is called ”The Biml Book”. Very difficult title there. It is a full book by Scott Currie [T], the creator of Biml, and Mr. Andy Leonard [T], one of my personal heroes who lead that book project, and where a bunch of other authors as well, where most of us are BimlHeroes who have been helping out writing that book. So very proud co-author of that book. Damian Widera: well, I would like to ask about something else because for sure the book will be a great present for many people including me and Kamil as we also work on BI projects as well. But I would like to ask you about something else. Because there are not so many women in the IT projects. How to convince women or young girls including my daughter to start to be a very good it professional? CW: I think part of that is encouraging them to get involved from an early age. This is a very complicated question, to be honest. You will get a thousand different replies to this. But what I would say is if you have small children it’s very common to buy girls things like, you know, dolls and teddy bears and things like that. But try and see if you can find some other things like puzzles or lab experiments or something like that and do it with girls as well. They are not just for boys. If you start at an early age with things like that and get them interested in something that is super fun then that interest will probably, you know, gradually increase over time to a point where they get into something like IT or even other STEM-related areas like math, science and so on. What I would say is start early, start with doing the things you would do with boys. When it comes to tech and IT, it is very gender separated at an early age. The same thing, you know, a lot of clothes are pink for girls and blue for boys. Stop doing that. You know? Treat them the same way. And that goes the other way as well. Play with dolls with boys as well. It goes both ways. So that is it and then after that when they get a little older there are lot of things like “Girls in Data” and “Tech Girls” all of these different initiatives where girls can get together and learn about – you know – playing with robots, learning to program and doing all of these things that might inspire them to get involved. DW: Well, that is great because this is exactly how we started and right now as my daughter is 14 actually she still has to fight at school that she can do better things on the computer in terms of programming than her colleagues. And sometimes the teachers say that “as you are the girl you should not play on the computer that much. It is for boys”. And this is very tough for a girl because she still has to convince also the teacher that well “I can also do that and I can be better than boys”. CW: Yes, and that is the other side of it where I would encourage especially men in the IT industry to work on changing those attitudes and changing the things that they convey. So if you hear someone say that, talk to them, especially man to man and say that “Hey I don’t think that this is the right attitude” because we need more women and we need more diversity in our business. And I feel like if that is coming from, you know, an older man – and in many cases it does – then get another man to tell him that “Hey, we might want to change this” and talk to him that way and try to change those attitudes. KN: That’s right. Still I think the problem is that the women need to unfortunately proof their knowledge more than the men. CW: Unfortunately, it is still the case. We do need to speak louder. We do need to fight harder to be heard even if we are equal, in the IT industry. And that’s something we need to work on and that is something that everyone needs to work on. So, if you see anything where someone is treated unfairly – whether it is a woman or a man – whatever –speak up! And start fighting those attitudes and those biases. KN: Yes, I always do. 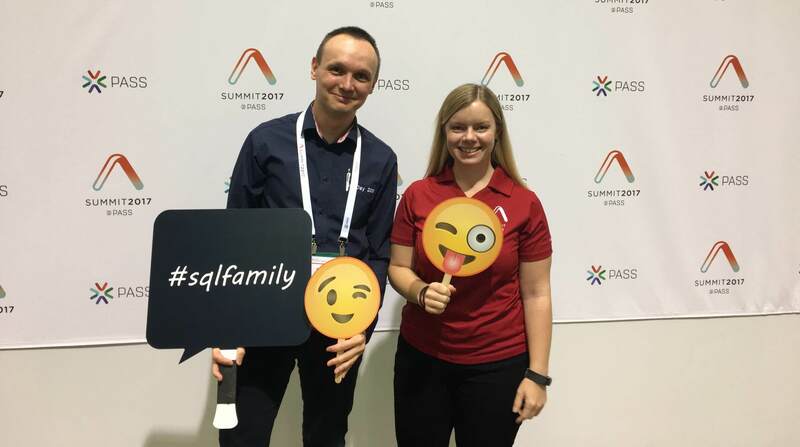 DW: Last week, because I was trying to write a blog post and I was with my daughter in Prague during the SQL Saturday and she was with me on the stage doing demos. And I told her about you Cathrine. And I gave her your example that woman like you can be like in the PASS organization or in terms of presenting stuff – you are one of the best and one of the most recognized person in our community and that is great. So at least she knows you and knows what she can do with that. And right now, she is thinking “How can I achieve that”. That is her next goal. CW: Yes, so thank you for that compliment. And there are so many great women in the SQL Server community. And I think that is maybe my last point on this thread here is that we need more women to be out there to be role models. And something that I try to do is not just… I don’t want to just talk about being a woman in tech, I want to actually be a woman in tech. I want to create blog posts, I want to be out there speaking, standing up, being visible and actually providing – you know – being a role model for young women and girls who might see “Oh, hey, there is another short, blonde girl who can actually do this”. To be a kind of role model so they can see more people doing this. So I think that is important as well for our community to have more women speakers, presenters, bloggers – actually doing these things, and just showing that we can, and we can do it and we can do a good job. KN: OK. So let’s talk about the beginning. When did you start your adventure with IT and how? Do you remember that? CW: Oh my gosh. Well, it’s been a long story. For me, I have always been a geek. So, back when I was 9 or 10 is when I started learning how to build my own websites. And I hated the drag and drop interfaces because they could not do what I wanted them to do, so I started learning HTML and CSS and that is kind of how I got into this. A few years later I started learning MySQL because I needed the backend system, and PHP as well because that’s what I used back then, and that got me into the world of you know – programming and development. Then I had a couple of years in high school, or the Norwegian equivalent of high school, where I studied media and communication and I did a lot of graphic design and interactive design and so on. So I moved on through university where I did even more hopping back and forth. I started learning something called interactive design, which is where I learned Java programming for the first time, and I thought that was really cool. I learned more about databases and then I ended up finishing with a bachelor’s degree in Java programming. [Whisper] Don’t tell anyone [/Whisper]. CW: So I have like this very diverse background and then… so funny thing is that I could not actually find a project on Java programming as my bachelor’s project, so that is when I learned SharePoint. I was assigned on a SharePoint project and I learned that. Then I got hired as SharePoint consultant in my first job but they didn’t have any SharePoint projects, so they said “We are going to put you on this Data Warehouse project”. And that’s how I got into Data Warehousing and BI. It’s been very back and forth, but I have a long background and I always knew that I wanted to get into IT. That I wanted to work with IT. I know programming, design and database development, so I can do a lot of fun things, and I love doing all of these things. So that was a bit of a background. But I accidentally ended up in Data Warehousing and I stayed there because I love it. KN: You also achieved the MVP award. It was two years ago I guess? KN: Yes, So you know it is a very big achievement even for a man and you did that. KN: So that is good. CW: And that is something that I am very proud of. I am the only Data Platform MVP in Norway and I am the only female MVP in Norway. So that is a big achievement. And again, going back to actually being out there and being a role model, I am very honored that Microsoft saw my contributions to the community and gave me that award. It meant a lot to me. KN: I thing you do a lot of valuable things so it is totally deserved. DW: It is great that in one point of time you did a project in SQL Server or Data Platform because you are now on our Data Platform Community and not in the SharePoint Community so it is good for us. For the entire community I should say. Do you have tools you like the most during your daily work? CW: I do. Am I allowed to mention specific product names in this podcast? CW: I am a huge fan of the Red Gate tools, and SQL Prompt is by far my favourite tool out there. SQL Prompt I use every single day for pretty much all the work I do in SQL, so that is the product that I use and that I will invest in on my own if my employer or company don’t want to pay for it. I would buy that on my own. So that is by far my favourite product. And the other side, obviously, like I mentioned in my introduction is Biml. Biml is also… Part of it is free and that changed my life when I started learning Biml. And there is also the licensed version of that. So those are kind of the two things I can’t live without in my work day. DW: As you are an MVP – what do you think about this program? CW: About the MVP program, I think… I absolutely love the program because it recognizes people who do a lot of things for the community. And they are focused on awarding people who help others in many different ways, either by speaking, blogging, answering things on forums. And I am so happy to see that Microsoft recognizes that community contributions are so important. I think that the flip side of that is that you don’t have to be a technical expert anymore to become an MVP and a lot of people still think that if you are an MVP you know everything. So that can be a little difficult when you have to say “I actually do not know anything about that topic at all”. It is also a little black box because there are no set steps to become an MVP, so a lot of people are confused about that but I think in general it is a great award that helps build up our community and encourages people to share their knowledge and help others. DW: great, I have a very similar thinking about this program as well. Maybe we should as Cathrine about the hobby? KN: Exactly – what is your hobby? CW: My hobby? Well, my work is my hobby. No… honestly like I mentioned earlier I have always been a geek, I have always enjoyed programming, developing, graphic design, doing all of those things. On my blog, that is kind of my little creative area, where I get to do some web development and graphic design as well. So I have always enjoyed those things. But I do… once in a while I actually do things outside of my computer as well. So I love hiking. I am from Norway and we go hiking a lot around – you know – mountains and water falls, and exploring the nature and forests and all of that. It is great way for me to disconnect and kind of – just relax and disconnect my brain and focus on just being in the present. So I love doing that and I also quite enjoy – well, it’s not computers, but I do love reading, watching movies, I am a sci-fi and fantasy fan… I think those are kind of my main hobbies and I enjoy travelling a lot. I have been fortunate enough to be able to travel to a lot of events all around the world. So I love travelling and seeing new places and trying new food as well. I am not a good cook but I like eating food. DW: But I have to say one think. 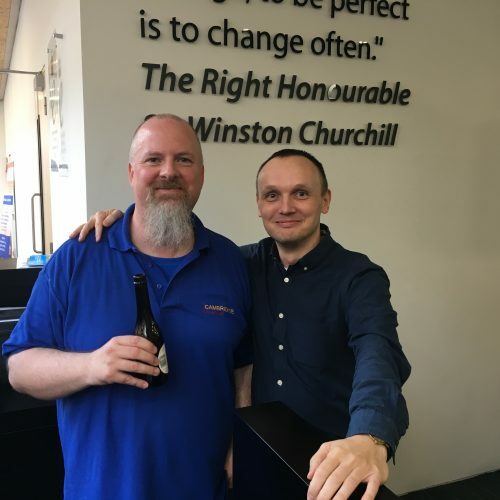 You totally missed on event and by the way Kamil and I we are one of the organizers of the event and this is SQLDay in Wrocław. And I think it is a good time and should definitely visit us next year and give us a talk. Because people actually have been asking about you so are definitely on our list (of speakers) and I think it would be also good to visit Poland. CW: I completely agree with you. I have missed that event for several years and I have been sad when I have seen all the amazing pictures and tweets on that. So I absolutely want to join you guys and let’s try to make that work! CW: Work-life balance… that is a tricky one, especially for me now being so involved in the community, where a lot of work and the rest of my life is blending together. I think what is important to me is I work a lot remotely so I work from home, I work from other places and I think it is important to have kind of a set schedule where you work certain hours and then when you are done working you get up and go somewhere else, like turn off your computer and go somewhere else. You know I am still on Twitter most of the time because all my friends are in the community, so there are a lot of things that are related to work. But don’t have work emails constantly on your phone. Don’t be available on Slack all the time. Be clear and set those boundaries for yourself and say that “I am available for work during these hours”. And if I choose to be on Twitter and have fun conversations with friends after that, that is my choice because this is kind of my hobby as well. But I think that the important thing is to get up and go do something else and go away from your work area even if you are working remotely. KN: So, you are working remotely currently but where are you living? KN: But in which city? CW: Oslo in Norway, but for the last couple of months I have been spending a lot of time Denver, Colorado. Beautiful mountains, gorgeous for hiking. CW: It is a little different… There is not a lot of water in Denver, but it is still gorgeous. KN: What are your daily habits? CW: Yes, that is a difficult question. CW: No, you didn’t prepare me for that one. Daily habits. Well, I get up, I eat breakfast, I have coffee and then I start my work day. The one thing I like to do is, for lunch breaks, to get up and go outside and go for a little walk or something like that, which helps me since I am sitting down so much during the day. And then you know have dinner, try as much as possible to go to the gym – and that does not happen every day – and then relax for a few hours. I’m not sure I have any other daily habits… I think that is it, yes, that is it. KN: …because you do a lot of speeches across many conferences basically and the question is how do you prepare yourself to do a speech? CW: Oh, I spend a lot of time preparing for my presentations. I probably spend on average around twenty-thirty hours on a new presentation building the slide deck, building the content. It is very important to me to have a good flow and a good story in my presentations. And then I also spend a lot of time just making sure that my slides look nice. They look nice to me, I’m sure others disagree… But just trying to make it very visual, finding some pictures, illustrations, working on that. And then I always – you know – I rehearse the session, I go through it a couple of times. I try to rehearse in front of the mirror, which is very awkward, but it is something that you have to do to prepare – I just run through it couple of times, make sure that I write down how much time each section of my session takes. And that actually allows me to see. I don’t have to follow a script but I know that I have 10 minutes to cover this topic, 10 minutes to cover that. And then if am early or late I can adjust it and kind of still stay on time. CW: Yes, I can and then I know if I need to speed up a demo or cut a demo if I am running late or if I need to explain something a little more detailed. And that seems to work well for me at least. CW: Yes, I do. I don’t get as nervous anymore but if it is a new talk I am always nervous because if I haven’t delivered it before… If it’s a talk I have done couple of times I am a little less stressed but I always get butterflies in my stomach and I am always a little nervous. And I think that’s good because I think it’s a good sign that you care about what you do. KN: Exactly, I think so. I think exactly the same. Tell us something about the PASS organization. What are you doing exactly in the PASS? CW: So in PASS I have been working as a community evangelist. I have been focusing on SQLSaturdays. SQLSaturdays, as you may know, that are free, one-day training events and we have around a hundred each year all around the world. And a large part of my job has been working with SQLSaturday organizers to help them publish new events and follow up with any questions, but also mentor new SQLSaturday organizers. Help them if they go “Hey I want to do this. How do I get started”. Explain the steps and what they need to do. Give them helpful tips on how to find a venue, sponsors, speakers, and marketing and all of these things. And then I am lucky enough that I have been able to travel to some of these events and be on-site representing PASS. Again, sharing what is PASS, what do we do, and talk to people about getting involved in the community. CW: It is not secret… It has been announced. I am leaving PASS in mid-December, so I have – when we are recording this –it’s about a month left. So I am getting through PASS Summit, which is where we are currently at and this week is a lot of fun, and the next couple of weeks I will be working on finishing off the projects I have and handing over to my co-workers who will be taking over the things that I have been doing. But I am not leaving PASS. I am leaving my role in PASS HQ, but I will still be involved in PASS as a volunteer. KN: Yes, absolutely. I can imagine. CW: Continue speaking, continue organizing and volunteering and, you know, even things like mentoring others. I have a lot of experience now talking to the members of the community. I am more than happy to continue helping in that way. But I do want to go back to tech. Like I said, I am a huge geek and I miss development and I really want to do more on Biml projects with all the cool things they [creators of Biml] are working on now. So going back to tech and doing that on a daily basis and then doing all the volunteering on weekends and on my spare time. KN: Are you missing the tech? CW: Oh, yes. I am missing developing things and seeing things actually being created. KN: Are you learning something during such conferences? As an attendee? CW: Yes, I learn a ton. I like to go to sessions about topics I know nothing about, to be honest. Things that I do not work on, introduction sessions to things that are so far away from what I do. I love doing that just to get an idea of all the possibilities that are out there. 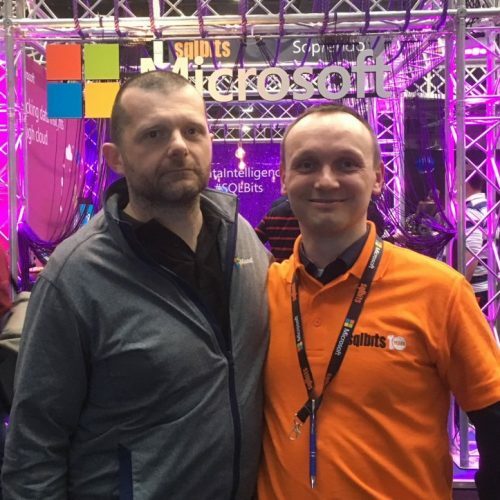 Recently I went to Microsoft Ignite and that’s a great place just to check out some of the sessions – you know – products I don’t use on a day-to-day basis. Just to see how this stuff ties into what I am doing. And the more you know about these things, I feel like the better prepared you are. KN: This is probably the hardest question in this interview. Are you a perfectionist? CW: Yes! Very difficult question. Yes, I am. DW: Difficult question and a simple answer. But from your perspective as a professional I know that you are because that is my feeling when you presenting. This is what I feel watching your sessions. But what about your daily life? CW: Very much the same. So, if you ever see the inside of my apartment things are very neatly organized and sorted and you know my clothes are – they are not messy at all. I am very much a perfectionist in my personal life as well. I am not sure we use perfectionist – but I like ordering things, I like things being aligned properly and I always make joke if you have a table cloth with checkered or any kind of pattern I have to put my glass down so it’s centered in the pattern. It is a horrible thing but it’s my personality. And that’s why I think working with data is so good for me because I am naturally very good at ordering, sorting and grouping and making sure that things are the right way. And same thing for my presentations – making sure that things look nice and attention to detail. Which in some ways can also be a curse because I have been working hard on learning that – you know – “80% might be good enough”. I want it to be 100% all of the time but it might not be practical to continue striving for that. I am also trying to learn that 80% is good enough. It doesn’t have to be completely perfect all the time. CW: Yes, it’s not achievable and it can stress you out if you always try and get to that perfection. KN: What hints would you give to young people who wanted to start in the IT market? CW: Oh, find something you enjoy doing. I think that’s the most important thing. I could say that “find the hot topic right now” and aim for that because you will get a good job or whatever, but I feel it’s more important to find something you enjoy, that you think is fun and that you really want just to sit down and learn more about because that is the kind of passion you want in a job. You have to do this every day. Find something you think is fun and dig into that and at the same time try and learn more about things that you might not use and just kind of dive into a topic that you enjoy and learn a little bit about everything else. KN: This PASS Summit conference, here are a lot of volunteers and I think this is a very good opportunity to tell the people why it’s worth to be a volunteer on the conferences and be engaged in the other organizations. CW: Absolutely, and that’s what PASS is all about, it is by and for the community, by and for the volunteers. There are so many ways that by volunteering you can advance your career and you can grow personally. So one thing is obviously by volunteering you are on-site, you get to talk to lot of the speakers if you are a room monitor or something like that. You can get to know more people and network in that way. But it’s also helping you with soft skills like communication and it is also good for your resume if for example you just have a single job on your resume if you are a young person in IT for example. If you have one job, but then if you add “hey I volunteered at my user group” or “I volunteered at a SQLSaturday” then you are showing potential new employers that you are active and you are willing to take that extra step. And for me if I had two people applying for a job, one who was good at their job but did nothing else and one who was good at the job but also volunteered, no doubt I would pick the person who did that little extra because it just shows that you are passionate about what you do. DW: How important is from your perspective a passion to do something. How can it help young people to achieve something that is really big because people would like to dream big? They should dream big but how the passion could drive them there. What is your opinion? CW: I think if you find something you are passionate about, it’s something you want to do, and it does not make it a chore. Something you want to do and keep doing that and if you enjoy what you are doing and it is something you want to do more of and that passion – especially in technology. You can learn more about a topic for example and get deep understandings of technologies if you are passionate about it. That can help you get better at your job or in terms of volunteering as well. The more you do it, it’s going to help you because you are building those connections, meeting people, you get to travel to events. I think if you have passion and you enjoy what you are doing then there is no limits and you can go and do whatever you want if you keep doing that. KN: Facebook is for your private life. KN: Thank you very much Cathrine for this interview. CW: Thank you guys for inviting me. I had a great time here. KN: Thank you very much. DW: And see you soon in Wrocław. DW: thank you, have a great day!